After the data targets have been added to the flow, there are two types of options that govern the behavior of the data flow when copying data into the targets. Data flow properties, which are set for the entire flow and, therefore, effect every data target. For convenience these options are displayed with each target. They are marked with an asterisk in the Target Properties window to indicate that they are set at the flow level. Target-specific properties, which can be set on individual target objects. Load type, which specifies the method DataMigrator uses to load the data. 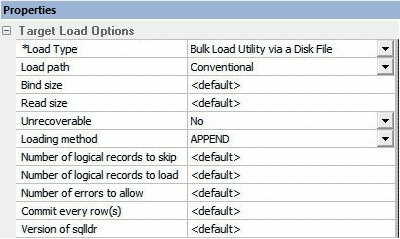 The options for load types depend on the target database type and may include: Insert/Update, Insert records from memory, IUD processing, Slowly Changing Dimension, Bulk load utility via disk file, and Extended Bulk Load Utility. If you are moving data to more than one data target, they will all use the same Load type. It will be displayed on all target objects and, if changed in one target, the change will be reflected in all the target objects. However, if you choose Insert/Update for the Load type, targets can have different settings for If the record exists/does not exist. Record logging, which allows you to create log files based on specific criteria. Each logging option can write information to a separate flat file. For example, if you choose Duplicate Rejection as a Record Logging option, a flat file called procedurename_dupl.ftm is created where duplicate records that are rejected will be recorded. You can use the log file as input for other processes. For details, see How to Set the Data Flow Record Logging Options. Commit, which specifies the number of rows to process before issuing a commit to a relational database target, or CHECK to a FOCUS or XFOCUS target. This option does not apply to file targets. A commit value of 0 indicates that a commit is only issued when the data flow completes. Note: A commit value of NONE can be used to indicate that DataMigrator should not issue any commit. This may be useful in cases where two or more flows should complete successfully before any data is committed to the target tables. A commit (or rollback) should be issued in a stored procedure after the data flows are complete. This option should be used with caution because if no commit or rollback is issued, the target table can become locked. Blocksize, which is the number of rows for loading in a block. This option only appears when insert records from memory is selected. Prior to Load Options , which can be set for existing targets to clear the target before the flow runs. The available options will depend on the type of data target. If the record exists/does not exist options, which specify behavior for Insert/Update. Load options specify the way DataMigrator loads data into the targets. If you are moving data to more than one target, they will all use the same load type. The load type is displayed on all target objects and, if changed in one target, the change will be reflected in all the target objects. Insert/Update. Allows you to set a behavior when loading records. If you select this option, you can set a behavior when duplicate records are found from the If the record exists drop-down menu. Insert/Update options can be set on a per target basis. Include the record. Allows the relational database target to handle duplicates. Reject the record. Issues a SELECT command against the target table to see if a record exists with the key values. If there are no key columns, DataMigrator screens all columns. If the record is found, the record is rejected. Update the existing record. Updates records if the key value on the input record, or entire record if there are no keys, are found in the table. All non-key values are updated in the target. Delete the existing record. Deletes the record if the key on the input record, or entire record if no keys, is found in the table. Include the record. Includes the key in the data target. Reject the record. Does not include the key in the data target. This option is only available if Update or Delete the existing record was selected. Note: When loading relational data targets, the Reject, Update, and Delete options can adversely affect performance, because they determine the existence of a key value on an incoming record before performing the specified action. This is done by issuing a SELECT command against the target table, and then waiting for the response. If one of these actions is required, try to limit the volume of records in the incremental change. These actions will perform best if there are unique keys on the table. Commit every row(s). Specifies the row interval to commit or write transactions to the database. Insert records from memory. Speeds the loading of the data target by inserting a block of rows at once. You can set the row interval to commit or write transactions, and the number of records to load in a block. Note: This option is only available for DB2/UDB CLI, MySQL, MS SQL Server, ORACLE, Informix, Sybase ASE, and Teradata 13. For other databases, the number of records in a block will default to 1 and cannot be changed. For details about loading relational targets, see How to Set Options for Relational Targets, and Target Properties Pane for Relational Targets. Loads much faster, since a block of rows are inserted at once. Requires input data to be clean. If any one row in the block causes a data source constraint violation, such as not null or unique index, the entire block is rejected for an MS SQL Server target. For other targets it depends on the database. Does not provide row counts (the number of records inserted or rejected) in the detail log or statistics. NA (not available) will appear instead. Does not provide record logging (used to write rejected records to a flat file for review). 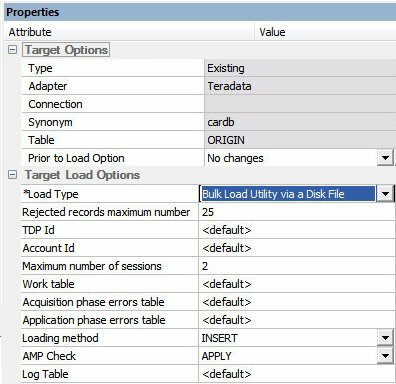 Bulk load utility via a disk file uses database bulk loaders instead of iWay to insert data into a target. DataMigrator automates bulk loading for Greenplum, Hyperstage, Ingres, Informix, Microsoft SQL Server, IBM DB2, MySQL, Teradata, Nucleus, Oracle, Sybase Adaptive Server Enterprise, and Sybase Adaptive Server IQ. You can set format version, maximum number of errors, first and last row to copy, packet size, and row interval to commit or write transactions. The options available will depend on the RDBMS of your target type. Note that rows rejected by a DBMS vendor bulk load program are not counted as errors. Users of the bulk loader should look into the vendor specific documentation on how to handle the error handling of the bulk loader program. 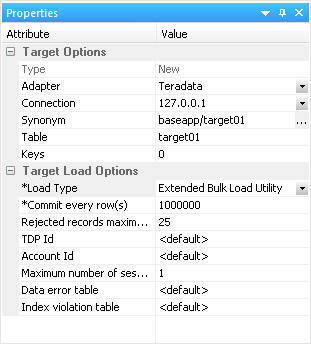 Extended Bulk Load Utility uses a database loader program with additional capabilities. Currently available for Greenplum, Hive, Hyperstage, Sybase ASE, Sybase IQ, and Teradata. IUD Processing enables you to load a data target with only the records that have changed. This feature is an optional, add-on component to DataMigrator available for selected relational databases. Slowly Changing Dimensions enables you to load a data target with column values that change over time. There are two column types. Type I simply overwrites the value. Type II allows you track activity before and after the change. Type II changes are handled either using an activation flag or end date/begin date. When you update a Type II column, you do not actually change its value. Instead, you update the activation flag to inactive, or the end date to the current date. You then add a new record with the new value and the activation flag on by default or the begin date set. IUD/Slowly Changing Dimensions is a combination of the previous two load types. The Insert/Update/Delete indications in the CDC logs are not applied directly to the target. Instead, the SCD Types of the target are used. INSERT. Insert the rows only. This is the default. REPLACE. Drops the existing destination table, and creates a new table. The bulk load option for DB2 is available for z/OS and IBM i only when configured for CLI, not CAF. For bulk load on IBM i, the target table name for DB2 must not exceed 10 characters. For bulk load on IBM i, the target table name must be a qualified name. The current library name must be specified, for example, library1/table1. If effective, the default value for FASTLOAD is ON. The default value is RECOVERABLE. TAB - A tab character. This value is the default. a - A character string. For example, ~. 0x nn - A hex code. For example, ox44 (a comma), or 0x0D0A (a return and a linefeed). The hex code uses ASCII for Windows or UNIX systems and EBCDIC for IBM Mainframes. The maximum number of simultaneous Load Sessions logged on to the database. This number depends on the features of the database that is used for bulk load processes. The maximum number of restart attempts for each Load Session that ends with error. Specifies the single character that is used for escape sequences, such as ,, or @;. Also used for escaping data characters that might otherwise be interpreted as row or column delimiters. 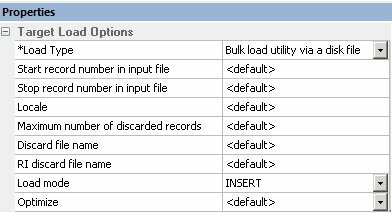 Enable this option if required by the DBMS Load Utility. OFF. No replacement required. This is the default value. SPACE. Replace New Line Character(s) with the SPACE character. a. An ASCII character, for example, ~. Replaces New Line Character(s) with the specified character. 0x nn. A hex code, for example, 0x44 (a comma). Replaces New Line Character(s) with the specified hex code. The hex code uses ASCII for WIndows or UNIX systems, and EBCDIC for IBM Mainframes. Characters used to enclose each alphanumeric value in the intermediate flat file that is loaded into the database. The enclosure consists of up to four printable characters. The most common enclosure is one double quotation mark. Numeric digits, symbols used in numbers, such as a period (. ), plus sign (+), or minus sign (-), and 0x09 (Horizontal Tab), 0x0A (Line Feed), or 0x0D (Carriage return) cannot be used in the enclosure sequence. In order to specify a single quotation march as the enclosure character, you must enter four consecutive single quotation marks. Note: When a non-default value is used, the intermediate file is created as the Greenplum term CSV, instead of what is called TEXT. These options are only available when BULKLOAD=ON and apply to all new flows using Greenplum as the target. Note: ALIAS_CASE controls the case of column names when new tables are created. Greenplum users may want to select Enforce lower case. 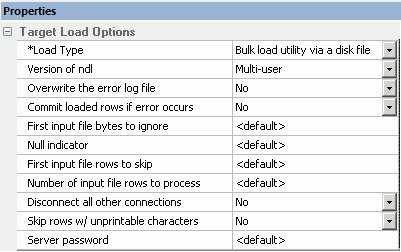 Bulk load utility via disk file has no additional options. Maximum number of load sessions logged on to the Hyperstage database. Table locking prevents other users from changing data in a table that is being loaded. Locking is necessary for maintaining data integrity while concurrent users access database information. Recognizes hexadecimal data in character fields. Checks the syntax, but not the data being loaded. Numbers of rows to ignore before starting to load data. The row interval to commit or write transactions to the database. The maximum number of errors allowed before loading stops. The default is the target RDBMS default. The number of commited rows. This value should be a multiple of the Block size. The maximum number of errors allowed before loading stops. The maximum number of load sessions logged on to the database. The maximum number of restart attempts after recoverable load session error. There are no additional bulk load options for MySQL. The Teradata Extended Bulk Load Utility uses TPT (Teradata Parallel Transporter) to load data. The maximum number of TPT sessions logged on to the Teradata database. The maximum number of rejected records that can be stored in one of the error tables before the job is terminated. If unspecified, the default is unlimited. The Teradata Director Program Id. The Account Id used to access the database. Name of table to contain records that were rejected because of data conversion errors, constraint violations, or AMP configuration changes. This must be a new table name. The default is the database default. Name of table to contain records that violated the unique primary index constraint. This must be a new table name. The default is the database default. Starts the server in exclusive mode. No other database sessions may be established. The server must already be started in multi-user mode and listening on the default port 1285. Appends to existing log.ndl file. Number of bytes to skip before loading data. Specifies the character to represent null. Number of rows to skip before loading data. Number of rows to process before stopping. Skips rows with unprintable characters. NDL server password. Required if Single User (ndls) mode and a server password actually exists. A direct path load builds blocks of data in memory and saves these blocks directly into the extents allocated for the table being loaded. A direct path load uses the field specifications to build whole Oracle blocks of data, and write the blocks directly to Oracle data files. Direct path load is much faster than conventional load, but entails some restrictions. Uses ORACLE parallel processing for faster loads. This option is only available for target tables with no keys. Size (in bytes) of the bind array. When the array is full, the array is loaded into the target. Size (in bytes) of the read buffer. If yes, the transaction will not generate redo entries. APPEND. If data already exists in the table, new rows are appended to it. If data does not already exist, the new rows are simply loaded. This is the default. INSERT. Insert the rows only. Specifies the number of logical records from the beginning of the file that should not be loaded. By default, no records are skipped. Specifies the maximum number of logical records to load. By default all records are loaded. No error occurs if fewer than the maximum number of records are found. Specifies the maximum number of insert errors to allow. If the number of errors exceeds this value, the load is terminated. The default is 50. Version of the SQL*Loader utility. Row number to begin copying data to the target. Row number to end copying data to the target. The combination of language and location. The maximum number of discarded records allowed before loading stops. The default is the target RDBMS default. File where duplicate records are discarded. The records will be stored for possible reloading. File where discarded records based on referential integrity will be stored for possible reloading. INSERT. Insert the rows only. If the table is not empty, the load operation ends. This is the default. APPEND. Used to insert additional rows of data into an existing table. Each new row must have a primary-key value that does not already exist in the table. Otherwise, the record is discarded. REPLACE. Replaces the entire contents of a table. MODIFY. Used to insert additional rows or to update existing rows in a table. If the input row has the same primary-key value as an existing row, the new row replaces the existing row. Otherwise, it is added as a new row. UPDATE. Updates existing rows in an existing table. Each new row must have a primary-key value that is already present in the table. Otherwise, the record is discarded. MODIFY AGGREGATE. If the primary key of the input row matches an existing row in the table, the existing row is updated as defined for the specified aggregate operator. If the primary key of the input row does not match an existing row in the table, the row is inserted. UPDATE AGGREGATE. If the primary key of the input row does not match the primary key of a row already in the table, the input row is discarded. If it does match an existing row, the existing row is updated as defined for the specified aggregate operator. OFF. Indexes are updated when each input row is inserted into the data file, which provides better performance when the data being loaded contains many duplicate rows. This is the default. ON. Overrides the global optimize mode setting in the rbw.config file. Version of the file used to store the format information for each field. Is the delimiter character(s) used between fields. It is used by the intermediate flat file used to load the database. TAB. A tab character. This is the default. a. A character string, for example ~. 0x nn. A hex code, for example, 0x44 (a comma) or 0x0D0A (a return and a linefeed). Is the delimiter character used between records. It is used by the intermediate flat file to the load the database. The row delimiter can be specified in the same manner as the (field) delimiter except that character comma (,) is not permitted. This parameter is available for Sybase IQ only. Activate log information about integrity constraint violations and the types of violations. With this option, two types of LOG files could be written into a temporary space in the configuration directory: MESSAGE LOG file etlblk.msg and ROW LOG file etlblk.log. Yes. Writes both MESSAGE LOG and ROW LOG files: etlblk.msg and etlblk.log. No. The LOG files are not written. This is the default value. Note: To use the Activate Server Log parameter, a Sybase logon ID should be used to connect to the DataMigrator server. This requirement is in effect for the Bulk Load Utility via a Disk File option only. For the Extended Bulk Load Utility, there is no need to use Sybase logon ID connecting to the DataMigrator server. For a Sybase Adaptive Server IQ target, the load will fail if the database returns more errors than the limit set in the flow. TAB. A tab character. This is the default value. Is the delimiter character used between records. It is used by the intermediate flat file to the load the database. The row delimiter can be specified in the same manner as the (field) delimiter, except that character comma (,) is not permitted. Activate log information about integrity constraint violations and the types of violations. With this option two types of LOG files could be written into a temporary space in the configuration directory: MESSAGE LOG file etlblk.msg and ROW LOG file etlblk.log. 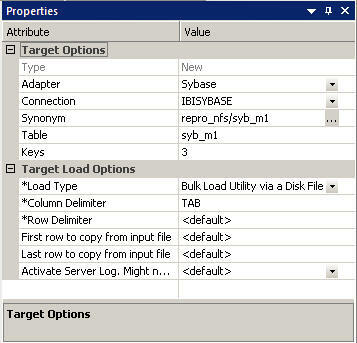 Note: Extended Bulk Load supports all Sybase IQ native data types, except BINARY and VARBINARY. Note: Teradata has two bulk load programs that DataMigrator supports. FastLoad is used for new target tables, and MultiLoad is used for existing target tables. Not all options shown in the image above are available for new target tables. Two environment variables, $FASTLOAD_EXE and $MLOAD_EXE, should be set for using bulk load. $FASTLOAD_EXE. Specifies the location of the Teradata FastLoad utility. $MLOAD_EXE. Specifies the location of the Teradata MultiLoad utility. The maximum number of rejected records allowed before loading stops. The default is the target RDBMS default. The maximum number of MultiLoad or FastLoad sessions logged on to the Teradata database. Name of the work table. This table provides information about all errors that occur during the acquisition phase of your Update operator job, as well as some errors that occur during the application phase if the Teradata RDBMS cannot build a valid primary index. This table provides information about uniqueness violations, field overflow on columns other than primary index fields, and constraint errors. INSERT. Inserts the rows only. This is the default. UPSERT. Does inserts for missing update rows. Note: This option is available for existing target tables with keys. The MultiLoad response to a down Access Module Processor (AMP) condition. ALL. Pauses the MultiLoad job when AMP is down. NONE. Allows the MultiLoad job to start, restart, or continue as long as no more than one AMP is down in a cluster. APPLY. Inhibits the MultiLoad job from entering or exiting the application phase when an AMP is down. Note: This option is available for existing targets only. Restarts the log table for the MultiLoad checkpoint information. This option is available for existing target tables only. Enter an annotation for this target. In the data flow workspace, right-click the data target, and select Properties. The Target Properties pane opens. No Changes. Does not delete the records already in a data target. Delete all rows from table. Deletes all rows and creates a database log. Truncate table. Deletes all rows from the table but does not generate a database log. This is a faster option than Delete all rows from table. Note: Truncate table is not supported by DB2 on IBM i.
Insert records from memory. Speeds the loading of the data target by inserting a block of rows at once. You can set the row interval to commit or write transactions and the number of records to load in a block. This option is only available for relational databases that support it, including DB2 on i V6R1 for CLI, DB2 on z, Informix, MS SQL Server, MySQL, ORACLE, Sybase ASE, Teradata 13, and UDB. Requires clean input data. If any row in the block causes a data source constraint violation, such as not null or unique index, the entire block is rejected. Does not provide record logging. For example, rejected records cannot be written to a flat file for review. Bulk load utility via a disk file and Extend Bulk Load Utility. Use database bulk loaders instead of iWay to insert data into a target. DataMigrator automates bulk loading for Hyperstage, Ingres, Informix, Microsoft SQL Server, IBM DB2, Teradata, Nucleus, Oracle, Sybase Adaptive Server Enterprise, and Sybase Adaptive Server IQ SQL Server and IBM DB2. You can set format version, maximum number of errors, first and last row to copy, packet size and row interval to commit or write transactions. Slowly Changing Dimensions. Enables you to load a data target with column values that change over time. There are two column types. Type I simply overwrites the value. Type II allows you track activity before and after the change. Type II changes are handled using either an activation flag or an end date/begin date. When you update a Type II column, you do not actually change its value. Instead, you update the activation flag to inactive, or the end date to the current date by default. You then add a new record with the new value and the activation flag on by default or the begin date set. IUD Processing. Enables you to load a data target with only the records that have changed. This feature is an optional, add-on component to DataMigrator. Note: The IUD Processing option is only available for existing relational targets. IUD/Slowly Changing Dimension. Is a combination of the previous two load types. The Insert/Update/Delete indications in the CDC logs are not applied directly to the target. Instead, the SCD Types of the target are used. To access the Target Properties pane, right-click a target object and select Properties. This shows the Insert/Update Load option. The Bulk load utility via a disk file Load option looks like this for SQL Server. Other relational targets will have different options. Is the connection for the data target. For a relational data target, this is a database server. For ODBC, this is a data source. Is the name of data target table. Is the names of key columns in order. These options are only available for existing targets. Does not delete the records already in a data target. Deletes all rows and creates a database log. Deletes all rows from the table, but does not generate a database log. This is a faster option than using Delete all rows from table. Note: Although Load Type appears in every data target, it is set on a per flow basis. Changing the type in one target will reset it for all targets. Specifies the behavior of the DataMigrator while loading data. Insert/Update options can be set on a per target basis. If you select this option, you can set a behavior when duplicate records are found from the If the record exists drop-down menu. Note: If you select Include the record, the record is passed directly to the relational database, which determines whether to accept it or not. If inserting a record would result in a duplicate key, the RDBMS will reject it due to a Unique Index constraint violation and return an error. Processing continues even if such errors occur, up to the number of errors specified under Stop processing after __ DBMS errors in the General properties of the flow. Delete the existing record. Deletes the record if the key on the input record (or entire record if no keys) is found in the table. Reject the record. Does not include the key in the data target. Note: The Reject, Update, and Delete options can adversely affect performance because they determine the existence of a key value on an incoming record before performing the specified action. This is done by issuing a SELECT command against the target table, then waiting for the response. If one of these actions is required, try to limit the volume of records in the incremental change. These actions will perform best if there are unique keys on the table. Block size. Specifies how many records you want to process at a time. Note: The value for Commit every rows should be a multiple of the Block size, for example, 10000 and 2000. These options will depend on your target type. This is available for Hyperstage and Teradata. Options will depend on target type. This option is only available for existing relational targets. Enables you to load a data target with column values that change over time. There are two column types. Type I simply overwrites the value. Type II allows you track activity before and after the change. Type II changes are handled either using an activation flag or an end date/begin date. When you update a Type II column, you do not actually change its value. Instead, you update the activation flag to inactive, or the end date to the current date. You then add a new record with the new value, and the activation flag on by default or the begin date set. Updates for Type I. Enables you to specify how updates will affect Type I fields. The options are Change all rows or Change only active rows. Change all rows is the default value. Enables you to load a data target with only the records that have changed. This feature is an optional, add-on component to DataMigrator. When this option is selected, the Prior to Load option is eliminated. Commit every row(s) specifies the row interval to commit or write transactions to the database. This load type is a combination of the previous two load types. The Insert/Update/Delete indications in the CDC logs are not applied directly to the target. Instead, the SCD Types of the target are used and deleted records in the source are marked as inactive in the target. In the data flow workspace, right-click the data target and select Properties. Drop Table. Drops and recreates the data target. Include the record. Includes the duplicate record in the data target. Include the record includes the key in the data target. For FOCUS/FDS or XFOCUS targets, the only Load Type available is Insert/Update. Synonym names for FOCUS/FDS files cannot be longer than eight characters. Note: Synonym names cannot be longer than eight characters. Is the name of the data file pointed to by the synonym. Is a fully qualified location. Should match the synonym name. Is the number of key columns. Does not drop (delete) the data target. Drops and recreates the data target. Specifies the method DataMigrator uses to load data. Since DataMigrator uses Insert/Update to load FOCUS/FDS or XFOCUS targets, you can set a behavior when duplicate records are found from the If the record exists drop-down menu. These options can be set on a per target basis. No changes does not delete the data target. New records are appended. Delete File drops and recreates the data target. For flat files and XML files, the Load Type cannot be changed from Insert/Update, and the data is always appended. For formatted file type EXL2K, the only Load Type available is Loading Flat File using HOLD. 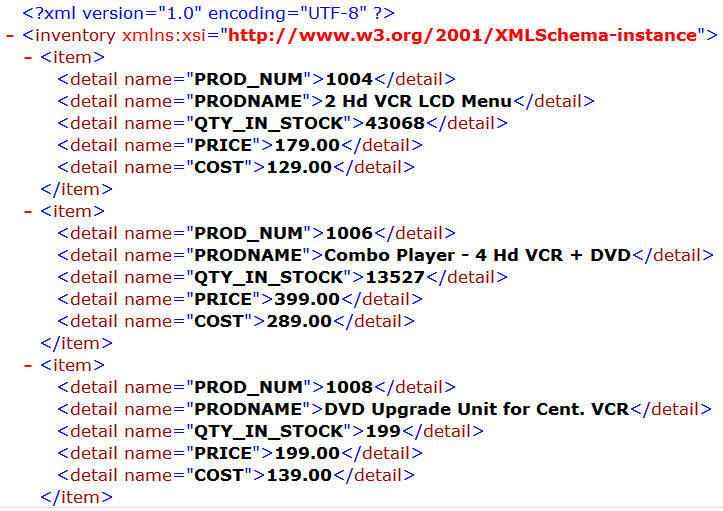 DataMigrator can create a new XML document with name/value pairs. For more information on any other structures, see Creating a Data Flow Using a Target Based on a Predefined XML Schema. Note: In order to create an XML document, a Server Administrator must first configure an adapter for XML. To access the Target Properties window, right-click a target object and select Properties. Is the directory where the synonym is located. Is the name of the XML document described by the synonym. DataMigrator will also create an XML Schema Definition with the same name as the data file and an extension of .xsd. Is set to Insert/Update for XML documents. Note that no updates are currently performed. Is the name of the top level element. Is the name of the row level element. Is the name of the column level element. Note: Delimited Flat File will only appear as a target type if it is configured on the server. Specifies a code page for the target data. 0x nn. A hex code, for example, 0x44 (a comma), or 0x0D0A (a return and a linefeed). The hex code uses ASCII for WINDOWS or UNIX systems and EBCDIC for IBM Mainframes. Inserts column headings as the first row of data and surrounds the column names with the character specified in the Enclosure field. This character is used to surround the column headings when Header is set to Yes. Does not delete the data target. Deletes and recreates the data target. Is the format of the target data. Setting the data flow record logging options allows you to write particular types of transactions to log files. Although Record Logging options appear in every data target, they are set on a per flow basis. Changing the options in one target will reset them for all targets. On the Flow tab, in the Tools group, click Properties, or right-click anywhere in the workspace and select Properties. The flow properties pane opens. Expand the Record Logging attribute. Select the check box next to the options that you want to log. Record logging options are optional and are not available when the data target is a formatted file. Click Save in the Quick Access Toolbar. For more information on record logging options for a data flow, see Flow Properties Pane - Record Logging Attribute. In order to insert or update rows in a Salesforce object, you need a custom field identified as an External ID field. Click your name and select Setup. Under App Setup, expand Customize. Select an object, for example, Account. Click Add a field to on the object page. Under Custom fields and relationships, click New. Select a data type appropriate to an ID field, such as Text or Number. Click OK. Enter a name, for example, Account ID. Fill in the other fields as desired. Select the External ID checkbox. Click Next twice and then click Save. The Account (or other object) Fields page opens. The new field is shown with its AP name, for example, Account_ID__C. Create, or update, a synonym for Accounts (or another object). The synonyms created for Salesforce.com objects identify the ID field as the key. To use the External ID field as the key, you must edit the generated synpnym and save a copy of it. In the DMC, double-click the synonym for Account (or another object). Right-click the ACCOUNT segment and select Properties. For the attribute KEY, type the name of the External ID field, such as ACCOUNT_ID__C. Click the DMC and select Save As. Enter a new name, such as accountx. Click Save. Using the alternative synonym you can now use the External ID field to identify rows to be iserted or updated as you would with a table in a relational database. Salesforce.com will automatically do an upsert; if a value of the External ID field matches a value already in the object being loaded, an update will occur. If not, it will do an update. The internal ID field is used to delete rows from a Salesforce.com object. To delete rows using the External ID, create a data flow that performs a DB_LOOKUP. You can also create a data flow that joins a table with a list of External ID values to be deleted to the salesforce object to obtain the values of the corresponding ID field.